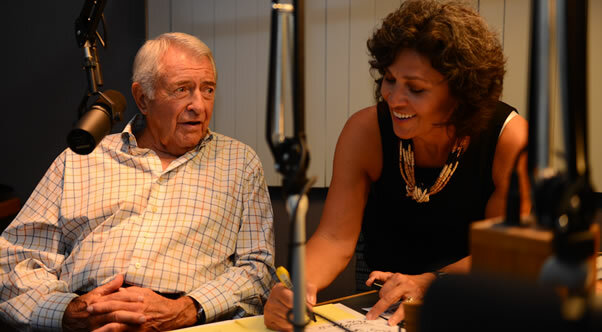 Here we are – Andy and I – sitting in WMAL studios on Jenifer Street recording our new podcast series called “Our Town”. We have come full circle. Both Andy and I worked together at WMAL radio station many years ago in the very building we are recording “Our Town”. Andy managed the station for 11 of his 36 years and I worked in programming and sales for 32 years. Needless to say, WMAL is near and dear to our hearts. We are here because we have an affinity for this station. It was our home – between the two of us for over 7 decades. Bill Hess, the current program director for Cumulus Stations nationwide has graciously allowed us to use this studio as our home base to record “Our Town.” We so appreciate his generosity, and feel fortunate to call Bill our friend. Back in the day, between the early 1960s and mid-1990s, everyone who worked at the radio station or in broadcasting believed there was something extraordinary about WMAL. The relationship that the station personalities and the listening audience shared was like no other. That relationship built on love and admiration was known in the Washington Metro area and across the entire country, we were a mecca for radio broadcasting. Emerging talent knew that WMAL radio was “THE” place to be if they wanted a successful career in radio, and listeners knew that’s where their radio dial need to be if they wanted up to date news, good music, and a relationship with talent. In fact, I just know that the radio dials of one in four listeners had rusted on the AM63 position. Andy and I, talk all the time about how special that time in history was to us. We refer to it as our Camelot, as Andy’s era as General Manager defined the glory days of WMAL. To this day, some 30 years after Andy left the station, not a month goes by when we don’t run into someone who remembers his editorials, Harden and Weaver bits, Mayhugh’s Radiothon, John Lyon’s silky smooth voice, Felix Grant’s Jazz, Trumbull and Core’s Gross National Parade, Tom Gauger’s key lime pie recipe, or the Redskins’ Championship years with Sonny, Sam and Frank….and who can forget “You’re next on Sportscall!” with Ken Beatrice. We recognized this nostalgic feeling for the golden years and we wanted to re-capture and preserve the stories of the people and events from that time and share them with people who would remember. It was a time when our lives, and the lives of our friends and colleagues, were at their peak, and when our community was at its best. In so many ways, Our Town DC is an extension of the love that Andy and I feel for the radio station, the friends that we met there, worked with and the community it served. So with that desire, combined with the constant challenge and need to learn new and emerging technologies, we came up with the concept of the Our Town DC podcast. As I researched the process of podcasting, I became interested in the prospect of re-telling stories of “our own town” and what made living and working here so special for us. I saw the opportunity to accomplish a variety of things. We would have a voice in the community again. We would record and preserve stories told by, and about, the very people who made things happen. We would impact and recognize the outstanding neighborhood we have lived and played in over the past 30 years. We would accomplish these things by creating a unique personal history of “our town” – our own Homegrown History. The intimate nature of the podcast was appealing…a friend talking to his long-time friend about their impact on local history without fear of censorship or worry about saying the wrong things or targeting the wrong demo. We wanted to interview a group of friends we’ve known for years who we knew were key players in our town’s history. We also wanted to produce the Our Town podcast without the scrutiny of a radio producer’s knife cutting out all references to the past or the data from a focus group trying to tell you how to think and what to say. We knew there would be interest in these uncut reminiscences of Washington DC in the “early days”. After all members of our society aged 50+ were nostalgic and not always interested in new trends like their younger counterparts. We knew these people were more likely to sit down, relax and visit with an old friend, and that while doing so they were likely to chuckle or shed a tear over conjured memories. What we didn’t much expect was to see interest in our project by twenty and thirty-somethings. What a bonus. Celebrate International Podcast Day – September 30!